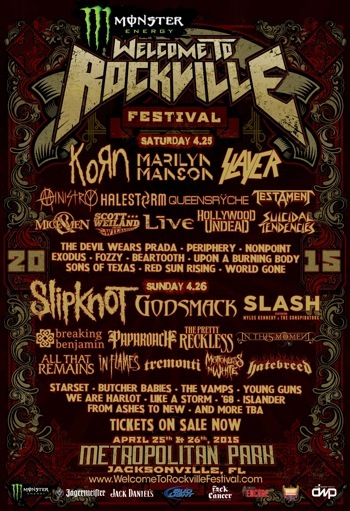 Our coverage of Welcome to Rockville: 2013, 2014. 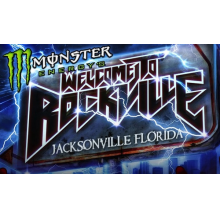 The daily band lineups have been announced for the fifth annual Monster Energy Welcome To Rockville, April 25 & 26 at Jacksonville, Florida’s scenic Metropolitan Park along the St. Johns River. Tickets are on sale now HERE. New for 2015 is the Monster Energy Welcome To Rockville Tequila World, with a Mexican fiesta theme, featuring a wide range of tequilas, margaritas, tacos and more. Metalachi—the world’s first and only heavy metal mariachi band—will keep the party rolling with three performances on the Tequila World stage each day. Admission to this area is free and open to those 21 and up. 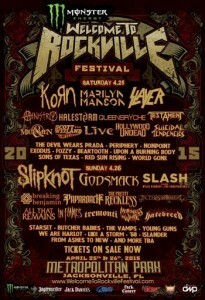 The initial list of tequilas expected to be offered in the Monster Energy Welcome To Rockville Tequila World is as follows: Pura Vida, El Jimador, Luna Nueva, Jose Cuervo, 1800, Monte Alban, Corazon, Siete Leguas, Margaritaville, Lunazul, Don Julio, DeLeon, and Peligroso. General Admission and VIP tickets, as well as hotel packages are on sale now HERE. A limited number of tickets are also available at select MetroPCS locations with no service fees.